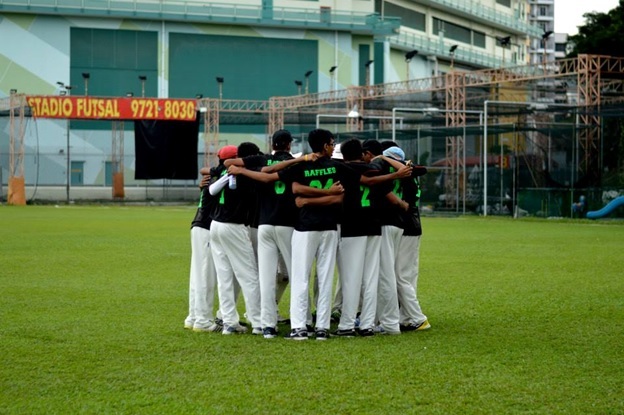 Coming into the final match at Ceylon Sports Club, the Rafflesian cricketers’ confidence was sky-high. Having steamrolled through their previous matches, including a previous meeting with ACS (I), the mood before the match was casual and relaxed. The captain of the RI team, Chirath Gunasinghe, won the toss and elected to bowl first, anticipating a quick capitulation of the ACS (I) batsmen thanks to a superior bowling attack on paper, which mainly consisted of pacers. Opening the bowling was Lakshan Srinivas, who was promptly hit for a powerful cover drive four on the first ball. Even with a rotation of many bowlers, ACS (I) kept the scoreboard ticking, hitting the ball past the rope multiple times before RI got the closest to destabilising the gathered momentum. A mis-hit by ACS (I) opener Archit Goenka went straight to Harsh Kackar fielding at slip, however the ball slipped through his hands and raced away. It took the RI bowlers a while, but the wicket of the lethal Archit Goenka was finally claimed at 56 runs, but it seemed to hardly affect the ACS (I) gameplan. Utsav Rakshit simply took his place, and continued the scoring. A series of further poor, short deliveries and misfields meant that ACS (I) had achieved a strong total of 78 runs at the halfway point of their innings. 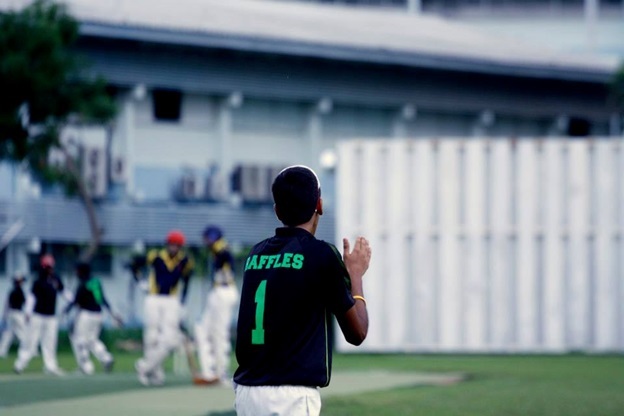 Towards the end of the ACS (I) innings, the Rafflesian bowlers managed to recover their form, restricting the opponents’ total to 155 as well as claiming wickets along the way – no mean feat, when it is known that the final 5 overs are when teams throw caution to the wind for maximum runs. 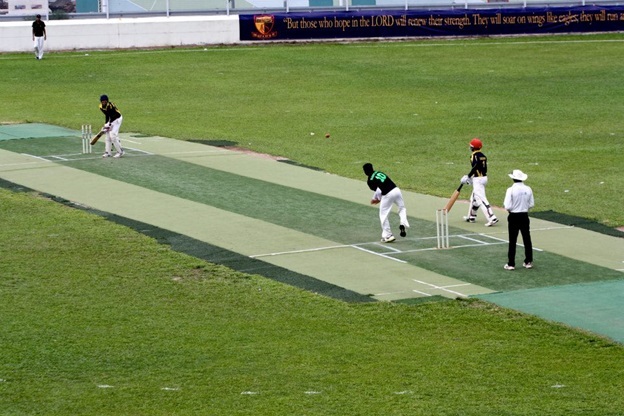 The RI coach, Mr Goh Swee Heng, simply cautioned the team against throwing away early wickets as the batsmen readied themselves, however, disaster struck on the very second ball of the Rafflesian innings. Kaushik got run-out early due to a miscalculation, and this set the pace for the majority of the game. Chirath lost his wicket in the next over at a total of 8 runs, and the loss was made more bitter when it was revealed that the umpire had made an incorrect decision with the leg-before wicket (LBW) dismissal. With the first seven batsmen dismissed for sixty six runs, even a respectable loss seemed impossible. Coming in at seven-down Sidantha, younger brother of Chirath, very nearly turned the tide of the game for RI. Sidantha batted sublimely, hitting five boundaries, and achieving a total of 35 runs off 24 balls. Vinay also stepped up when the team needed him the most, hitting 22 runs off an equal number of balls with a sweet slog-flick that went for 6 above the head of the fielder at square-leg. This sudden revival swept up the spectators in the euphoria, who commented that “even though [they] did not initially understand the game, the final overs were really exciting”. This partnership added hugely to the tally, with the final three batsmen adding 70 runs to eventually end at 136 runs while giving away just one additional wicket; a respectable score by any standard. Unsurprisingly, the whole RI team felt disappointed by their overall performance, with Mr Goh lamenting that they had “lost the game in the first few overs of [their] bowling”, having given away nearly 40 runs within 5 overs. Captain of the team, Chirath was dissatisfied with the team’s performance. “Chasing down 155 was no big deal – we used to score 160 in group stages, but it seems like the pressure got to us today,” he said. When asked about the partnership between the final three batsmen, he also added that achieving a total of 136 runs was really “impressive”. Sidantha himself was humble about being the top scorer for the Rafflesian side. “When I came out to bat, I came out there to have fun, and I’m sure we gave them a good fight, but ACS was the better team today,” he said. Second highest scorer Lakshan, a Year 6 player, was regretful that he could not cap off his final RI game with a win, commenting that the game was a “memorable” one. He will still be continuing on at the national level, however, as will many other RI players. All eyes will be on the new captain, Sidantha Gunasinghe, for next years competition.